Whether you are looking for a long endurance pipeline inspection UAV, or a fully autonomous wildlife conservation drone, the DeltaQuad Pro #INSPECT provides the ideal platform for high resolution thermal and RGB recording. 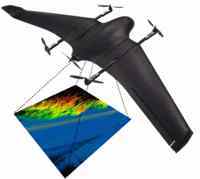 An inspection UAV is an Unmanned Aerial Vehicle that carries an inspection camera that records high resolution video footage with geo-coordinates as subtitles. The camera is nadir facing, that means it is pointing directly below the vehicle. An inspection or reconnaissance mission is planned and the UAV automatically takes off, flies the predefined route and lands at the designated spot. The DeltaQuad Pro #INSPECT is an unmanned aerial vehicle that can takeoff and land helicopter, and fly efficiently like an airplane. As a result it can operate in confined areas and fly long distances. It can be equipped with a high resolution video camera that records both RGB and Thermal video. The onboard GPS embeds the coordinates on this video for later analysis. The DeltaQuad VTOL inspection UAV is easy to transport in a rugged flight case. The efficient design makes it fit in the back of a regular car or truck. It is deployed and ready to fly in under 2 minutes. It can fly a distance of up to 150KM in a single flight.